Jasper Candle is a ruthless compensation lawyer who finds blame behind every misadventure. But when 3 year old Ollie dies because of the measles (MMR) vaccination controversy, a cancer patient dies in hospital as a result of an infection caught from another patient, and Jasper's wife commits suicide in mysterious circumstances, Jasper's convictions are tested to the limit. Investigating the enigmatic death of his wife Jasper uncovers a devastating family secret, an inherited physical disorder running in the family which forced an impossible decision upon her. As the investigation unfolds Jasper finds blame for her death increasingly difficult to apportion and this re-examination of culpability conflicts strongly with his professional convictions and practices. 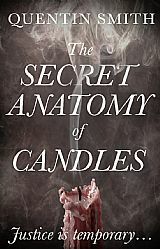 How was The Secret Anatomy of Candles conceived? My inspiration to write this novel originated in the MMR vaccination controversy which saw an emotive media campaign champion the findings of a small and subsequently discredited piece of medical research which suggested that MMR vaccine causes autism. I found the inevitable consequences of a drop in MMR vaccinations intriguing, particularly the notion that legal action might result out of it should a tragedy occur. This fits in with our society's current obsession with the culture of compensation which is unsustainable in its present form. But the MMR controversy needed more to make it a full length novel and this is where Jasper Candle, the ruthlessly successful compensation lawyer, and his enigmatic wife and family background fit in perfectly to bring the prickly concept of blame and retribution to life.